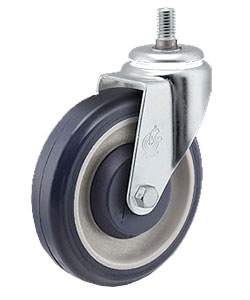 5" Universal replacement caster for shopping carts that have 5" wheels. The Polykat features a polyurethane tread mechanically locked to a polypropylene core. This design helps prevent tread separation. These feature outstanding wear characteristics and floor protection. The wheels resist most chemicals, solvents, acids and oils. The rounded tread provides better rollability an maneuverability compared to other wheels. These feature a double raceway bearing that is insert-molded into our polypropylene hub. This bearing is a single spindle design that cannot become misaligned with use. It is also sealed on both sides after being pre-lubricated with our high-quality grease. Overall Ride Height : 5-7/8"
5” shopping cart casters with standard stem fits most shopping carts. Non-marking Polyurethane wheels, sealed precision bearings & thread guards. Rolls easily and protects floors. Standard 1/2-13 x 1" threaded stem, nut not included. Perfect fit just like OEM... Fast shipping and Easy! We replaced the wheels on about 40 shopping carts we use in our warehouse. The wheels work perfectly. They were shipped quickly and we had no issues. Will buy them again when we need to repair more of our carts. These casters were the perfect fit for the ones that were worn out. They also look just like the ones that came off. Well worth the money, what little it cost. I will be a repeat customer.